Our Carbon Block Tandem is designed for people who want delicious tasting water that is free of chlorine, organic chemicals, lead and parasites and who DON'T want the high purity, fluoride free water available from the MB Series filter. The Carbon Block Tandem will suit you particularly well if you want a filter that produces water with great taste, is easy to use, and is moderately priced. High chemical absorptive capacity including chlorine, chloroform, VOC and TOC reduction. Lead reduction of greater than 90% at 2,500 gallons. Cyst reduction including cryptosporidium and giardia with greater than 99.96% of 1 to 2 micron particles. 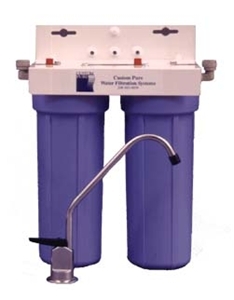 Note that the Carbon Block Tandem Filter is intended for use on microbiologically safe water. If it is to be used on water known to be microbiologically unsafe, the ultraviolet sterilizer is additional required equipment. Counter Top and Under the Counter models available. If you are in our area, we invite you to come to our store and see the filter and its installation for yourself. Or Contact us to schedule an installation (greater Seattle area only) or shop online and install it yourself. The following links will take you to detailed product descriptions in the shopping cart where you can purchase these products. To return to this page, use your browser's Back button.